India is a very vast country which has many different Festivals and has great diversity in it. Among so many festivals in India Holi is one of the biggest festivals celebrated. Holi is also known as one of the most celebrated festivals in India. Holi in India is celebrated with lots of excitement and people eagerly wait for Holi. Holi is the festival which is celebrated with friends and family. People celebrating Holi with each other gives the feeling of togetherness and closeness. Holi festival is also known as the festival of love in which people forget all the animosity among each other and celebrate the festival with unity and togetherness. The Holi celebration is done for two days. On the first day of Holi, the Holika Dahan which is a log of wood burned to celebrate the victory of good over evil. The story of Holika Dahan is related to the evil king Hiranyakashyap who wish to have burned his son Prahlad’s. But the evil aunt of Prahlad, Holika got burned in the fire and Prahlad got saved. So, from that day people start celebrating Holika Dehan to celebrate the win of good over evil. Then on the second day, of Holi people celebrate the main Holi by putting color on each other. People make plans to color there family and friends. Everyone wants to be the first person to color the other person first. Everyone is socked in water and color of Gulal. Also Read : Which is the Best Place to Visit in Delhi? People also offers Gujiyas sweets to everyone. Holi is also celebrated to welcome the season of spring which will help in the harvesting of the crops. People also celebrate Holi to mark the enduring love of Lord Krishna and Radha. In the Holi celebration, people are smeared in different colors which makes a kaleidoscope of different Holi color. These reasons to visit India during Holi will surely provoke you to visit India during this amazing festival of colors and happiness. Festival of color adds vibrant color to the white and black society. It lets you loose and finds the child in you. It celebrates the new beginning and arrival of spring. Gives the feeling of togetherness. It also celebrates unity, love, and Passion. It also urges your taste buds by the mouth-watering food. It also demonstrates that color speaks all the language. Relives the cheerful atmosphere with electrifying energy and music. India is highly diverse and has a different culture and tradition in it. Holi is celebrated with many different ways in different states. Different unique ways in which Holi is celebrated. 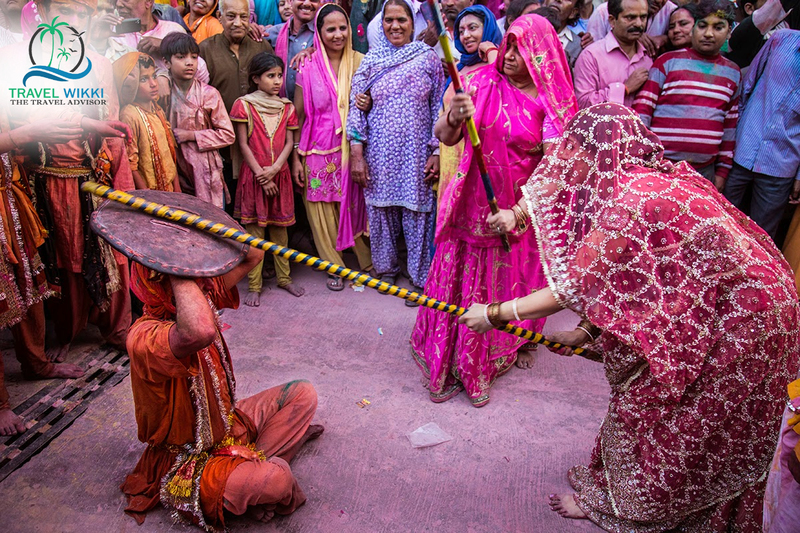 Lathmar Holi is celebrated in Barsana and Nandgaon which is near Mathura and Vrindavan(Uttar Pradesh). The Lathmar Holi is related to the history of Lord Krishna and Radha. The Lathmar Holi was originated when Lord Krishna came to visit his beloved Radha in her village and Lord Krishna made Radha and her friends tear up. So to take the revenge from them, the women of the village chased Lord Krishan with the Laths (sticks) and made him go out of the village. The Lathmar Holi is celebrated in Barsana and Nandgaon where men from the Barsana village come to Nandgaon village to get beaten(playfully) by the women of that village. Men’s also come prepared with safety and protection as much as they can. It is the most unique way to celebrate the festival of Holi. Also Read : 20 Places To Visit In Rajasthan To See The Royalty In 2018! 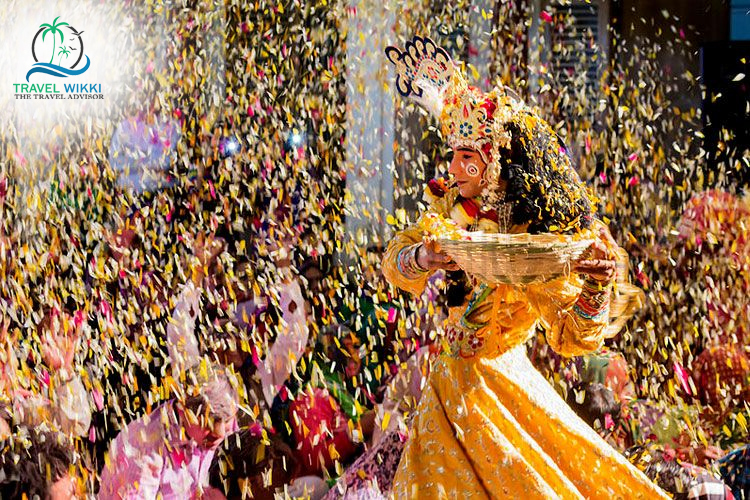 Phoolon wali Holi is celebrated in Vrindavan at Banke Bihari temple. The Banke Bihari Temple is believed to be the birthplace of Lord Krishna. Phoolon wali Holi is a 20min affair in the temple. It is the Holi celebration which is not played with dry and wet colors. This Holi celebration is celebrated one-day prior to Holi celebration. The Phoolon vali Holi is celebrated from 4 pm when the gates of the temple open. After entering the Temple the flower is showered on the people by the temple priests. It would be best to enter the temple as soon the gate of the temple opens so you get the most time to enjoy and have the perfect time to take the photos when the flower in mid-air. Pushkar is one of the best places to visit for the celebration of Holi. People from different part of Indian and abroad come to visit Pushkar. Pushkar is always known as the hub for the foreigners, whether its Holi or any time in the year. At the night before Holi celebration, a big campfire is burnt out known as Holika Dahan. The place gets fully crowed by the Indian and Foreigner tourists. Pushkar is famous for the Pushkar Lake, the Brahma temple and also the Camel safari. Holi in Pushkar is on another level. Holi is also played with flowers and also the colors. Kids throw water balloons and everyone puts colors on each other, which makes the celebration so unique and beautiful. People Dances on Holi songs and also sings the song with the groups. Many different parties are also conducted in the city. 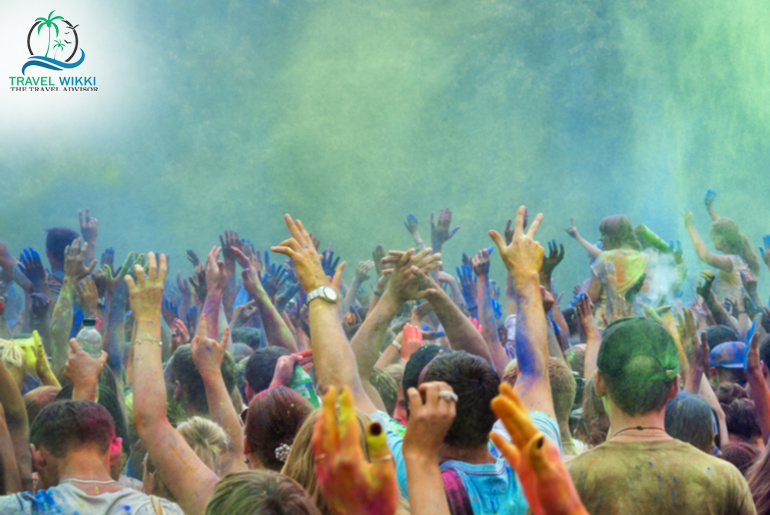 Holi in Pushkar will definitely be one of the craziest experience would be witnessed. Next articleHow To Plan A Tour Using The Online Travelling Website? Hi, I am Pankaj Sharma and I am a nomadic travel blogger and writer. I love wanderlust and to capture moments in my small DSLR camera. During leisure, I pen down my whole experience of the journey in a small piece of a paper that ultimately transcribed to an awesome blog post.